Baby Hazel Royal Bath is the latest installment of games devoted to our adorable cutie named Baby Hazel. In this episode our girl wants some more attention from her mother. Her mother is busy caring for her little brother, Matt, and doesn’t really have enough time to devote to Hazel. This is where you come in! 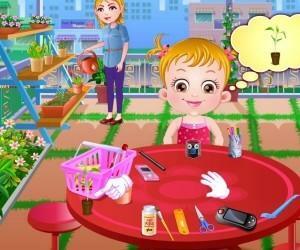 Over the next four levels of the game, you must help Hazel and her Mum through all the necessary activities. The game begins with Hazel trying to get her mother’s attention, while she is busy taking care of her little brother Matt. The object on this level is to keep Hazel entertained while helping her Mom take care of baby Matt. You will have to use the mouse in order to hand Hazel various toys as well as hand Mom useful items to care for baby Matt, such as bottle, rattle, etc. Hazel becomes upset and so then Mom suggests to give her a royal bath. Mom begins to prepare Hazel for her royal bath by giving her a massage, but she is interrupted when Dad comes in with Baby Matt asking Mom to calm him down. While Mom becomes busy rocking Matt to sleep, until she eventually puts Matt down in his crib and we click on Hazel to massage her and keep her happy. Finally Mom returns and finishes the massage which makes Hazel extremely happy. This is the royal bath scene. It begins with Hazel putting on a chocolate face mask with cucumbers. Mom comes in and has Hazel get into a tub full of chocolate and then moves into a milk bath. She has a blast as mom throws in rose petals and toys as while giving her a hunk of chocolate cake to eat. Mom then leaves the room to go and to prepare Hazel’s dress while Hazel finishes her bath. This is the last level in Baby Hazel Royal Bath. It is where Hazel’s Mom begins to help her dress for her dance class, but is interrupted by a phone call that takes long enough and Hazel starts to get impatient. So then it is up to you to help her finish dressing up for dance class. She gets a call from a friend during the middle of her dressing session. Finally Mom is off the phone and helps her finish dressing-up. So now, Hazel is ecstatic!!! 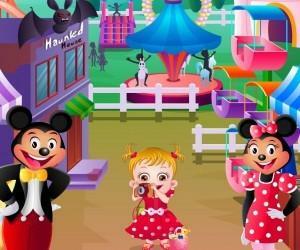 This is a fun and engaging game for preschool kids and especially little girls that love this sort of interactive dress up games and it is also great for younger players. The levels are easy to play through and the problem solving is not difficult at all. Why don’t you try it out and see for yourself? Baby Hazel’s mother is busy taking care of her younger brother Matt and leaves Hazel unattended. This makes our little Hazel lonely and unhappy. Mom notices her sweet angel is upset, and she surprises her by giving her a royal bath. The whole experience begins with a soothing massage, then a hot refreshing bath, and finally she dresses Hazel in beautiful costumes and accessories. Help mom take care of our beloved Baby Hazel. Let’s give her the attention she deserves!